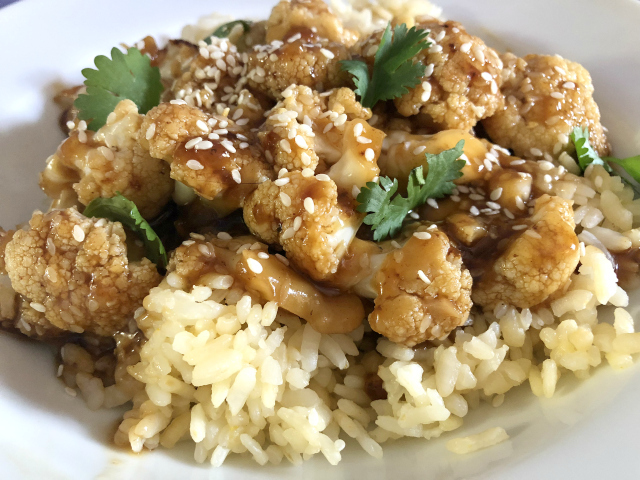 Instant Pot Sticky Sesame Cauliflower Bites. Perfect for a quick meal over a bed of rice or on their own as a snack or side dish. Ready in a flash in the Instant Pot! Ever wish you could grab dinner at a drive-thru? I sure do! Except I want it to be relatively healthy and gluten-free. That doesn’t happen often for me, but I still wish it could when I drive past Panda Express. 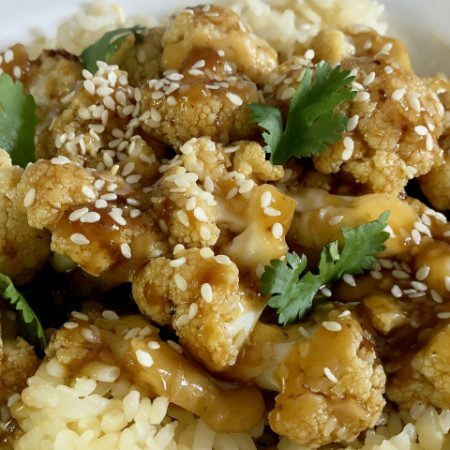 I’d love to have their Sticky Sesame Cauliflower. The last time I drove by, there were at least six cars in the drive-thru line. I’m betting I can make this dish in less time than the people spent waiting in that line. It’s so simple and SO fast! I love the Instant Pot for many reasons, but the hands-off cooking time is my favorite. While it isn’t always that much faster than other cooking methods, it doesn’t require me to stay with a pan on the cookstop. This dish takes less than 5 minutes to prep, a few minutes for the Instant Pot to come to pressure, 4 minutes of cook time and then a few minutes on saute mode. See? Less time than sitting at the busy drive-thru! The Instant Pot has been such a game-changer for easy meals here. 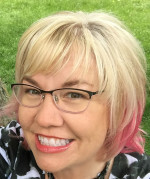 While the “Instant” part of the name can be misleading, it is a huge time saver for me and the cooking time is hands-off which means I can do something else while dinner is cooking, like create more recipes for the Instant Pot. I love this so much I’ve been working hard on an Instant Pot cookbook. Recipes are in the hands of a small army of recipe testers. I can’t wait for you to see this cookbook! A few words about ingredients: gluten-free soy sauce (I use Tamari) can be substituted with Bragg’s Aminos or Coconut Aminos. If you happen to have lots of extra vegetable broth or stock in the kitchen, you can replace the water with that for a bit more flavor, even though this is a very flavorful dish. I’ve garnished with cilantro in the batch I photographed, but this is also just as good with green onions. Alright, let’s get right to the recipe. Enjoy! In a bowl, combine water, tamari, rice vinegar, maple syrup, garlic, sesame oil and ginger root. Whisk to combine. Add arrowroot or cornstarch and whisk to prevent clumping. Add cauliflower florets to liner of Instant Pot or Electric Pressure Cooker (EPC). 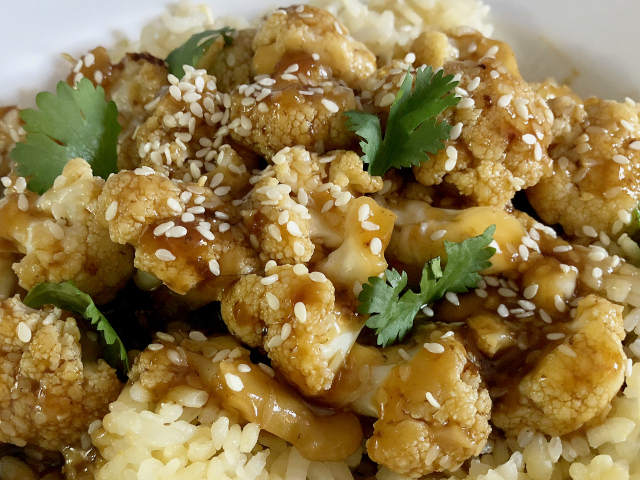 Pour liquid mixture over the top and gently toss to coat cauliflower with sauce. Seal Instant Pot/EPC. Set to Manual High Pressure for 4 minutes. Once pot has come to pressure, cooked for 4 minutes, then allow a 5 minute Natural Pressure Release (NPR) with the keep warm/cancel button illuminated. Carefully release any remaining pressure. Turn Instant Pot/EPC to saute. If yours has an adjustment for saute level, use the high setting. Saute for 3 to 5 minutes while frequently stirring. This allows the sauce to thicken. Toss with 1 Tablespoon of the sesame seeds. Use remaining sesame seeds and cilantro or green onions to top once the dish is in a serving bowl. « Gluten-Free Pumpkin Pie in Kansas City! Tried this w my new 3 quart Instant Pot and got myths burn warning. Tried it again, this time waiting to add the corn starch until the end on sauté mode and, success. I recommend waiting to add the cornstarch at the end-first remove the cauliflower with a slotted spoon, thicken the sauce, then recombine them.